A tale of two Shi’a towns targeted by CIA-backed “moderate rebels,” as told by Sarah Abed in an exclusive to We Are Change. The suicide bomber has been identified as Samer Hassan Yousef. Exclusive article written by Sarah Abed for We Are Change. Syrians took pride in the fact that their country was nonsectarian, secular and united. That is… until March 15th, 2011, when a carefully planned and calculated imposed war invaded their jasmine scented country. Since then, sectarian hate has surfaced and been empowered by terrorist groups that now boldly commit crimes against humanity in broad daylight without fear of condemnation. New information has surfaced from multiple sources and confirmed by my exclusive contact in Syria that the NATO/US-backed Nour Al Din Al Zinki movement was behind the massive suicide bombing explosion that took place in the Al-Rashideen area of west Aleppo. During a negotiated population transfer deal, a suicide car bombing targeted the Shi’a civilians being evacuated from Kafraya and Foua; two cities with a population of roughly 40,000 people that have been besieged by “moderate rebels” since March 2015. Previously this same group was responsible for beheading a Palestinian child named Abdallah Issa on the back of a pickup truck. I wrote about him more in a previous article. These terrorists are anything but moderate, they have traumatized, killed, and starved the civilians of these two cities on an almost daily basis for the past 2 years. Car bombs, rockets, gas cylinders, and shells have torn these two cities apart and rendered them almost uninhabitable. By December 2015, entire families were homeless and thousands killed, mostly women and children. A true genocide of a religious minority. The one remaining hospital that was attending to all of the injured, performing sometimes five major surgeries a day, was bombed last year as well. Schools have been obliterated. Terrorist groups cut the citizens water off forcing them to carry water from wells which they empty into their tanks. They are eating grass and chard. The Syrian government’s only way to send aid to the residents is through parachutes. Gaysh el Fatha, among other terrorist groups in the area, have been seen on video saying they will run over their bodies if these Shi’a traitors and refer to them as pigs and dogs. They are heard saying that they will slaughter and behead them. Even young children are singing along and are being indoctrinated to believe that Shi’a are not worthy of living. On April 15th, 2017 some 5,000 inhabitants of the northern cities, mainly women and children, were brought by bus convoy to the government held city of Aleppo but were stopped while still in the “rebel” controlled area. Inhabitants from the southern city had been brought up to Aleppo and were kept under government guard. This latest evacuation was made possible under a deal struck between Damascus and militant groups in late March that envisaged the transfer of 16,000 people from Foua and Kefraya in exchange for the evacuation of militants and their families from the government-held towns of al-Zabadani and Madaya in Rif Dimashq Province. Iran, speaking for the Syrian government, and Qatar, a financer of the radical “rebels”, negotiated the deal. There are many other issues involved in the deal including Qatari hostages held by Shia groups in Iraq, very large payment from Qatar to “rebel” groups (Al-Qaeda) and some non-disclosed items. In December an agreement had allowed for the exchange of wounded civilians. When buses were on their way to evacuate elderly and wounded civilians from the two northern cities they were torched by some rebel group. New buses had to be sent in order to facilitate the exchange. It is now confirmed that Nour al Din al Zinki movement prepared the VBEID in Darat Izza and sent to al Rashadeen in advance of the bus convoy from Kafraya and Foua and waited for the right time to explode and cause maximum fatalities. It is widely known and accepted that the Nour al Din al Zenki group is financed, armed and promoted by NATO, as moderates. 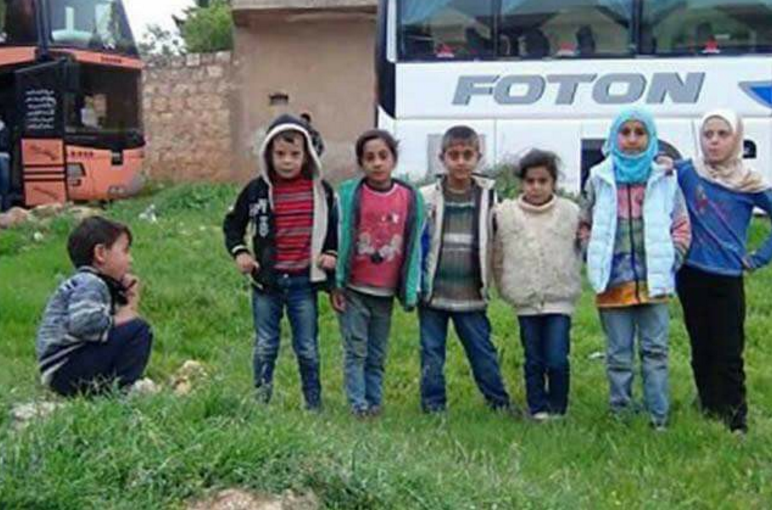 The civilians in their buses, mostly elderly, women and children, were guarded by “rebels” of Ahrar al Sham. They were hungry. Someone appeared on the scene and distributed potato chips/crisps. When children flocked around the food distribution a blue car drove up and a very large explosion occurred. Four buses full of people and a number of ambulances were totally destroyed. 126 of the civilians, only a mile or two from the safe government area, were killed in the suicide attack including 95 children. Many more were wounded. 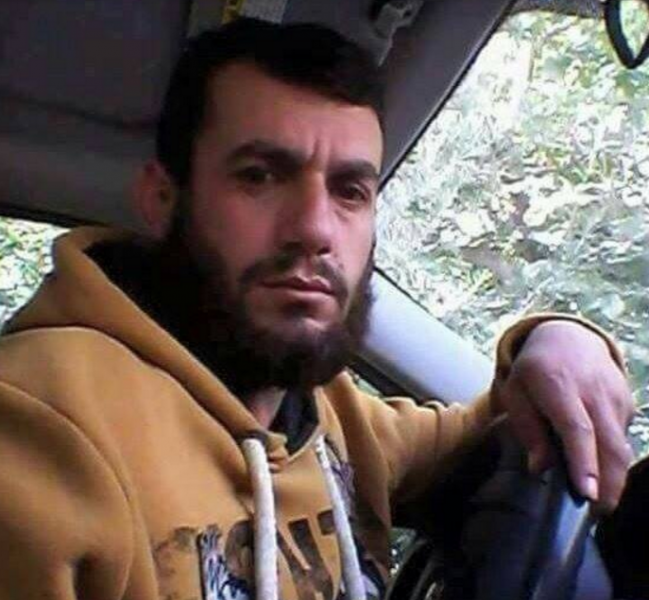 An unknown number of Ahrar al Sham “rebel” guards were also killed. “Rebel” groups in the Idilb government are either aligned with al-Qaeda in Syria or with the Qatari sponsored Ahrar al Sham. Ahrar al-Sahm is the group responsible for the execution of the negotiated population exchange. Parts of al-Qaeda have publicly disagreed with the deal. This intentional act of sectarian hate took the lives of 126 people mostly women, children and elderly that were finally being transported to a government held area outside of Aleppo. Nour al Din Al Zinki is no stranger to committing crimes targeted at pro-government civilians and specifically Shi’a. The group along with other Wahhabi practicing House of Saud backed terrorists consider Shi’a to be prostates, infidels, and have repeatedly referred to them as dogs and pigs in many videos that have surfaced over the past few years. Nour al-Din al-Zenki, along with the Abu Amara Brigades, has been accused of executing people by throwing them down buildings when they still controlled Aleppo. In May 2014 al-Zenki received increased financial support from Saudi Arabia after it withdrew from the Army of Mujahideen. The group also received financial aid from the United States, in a CIA run program to support US-approved rebel groups, reportedly via the Turkey-based Military Operation Centre (MOC). 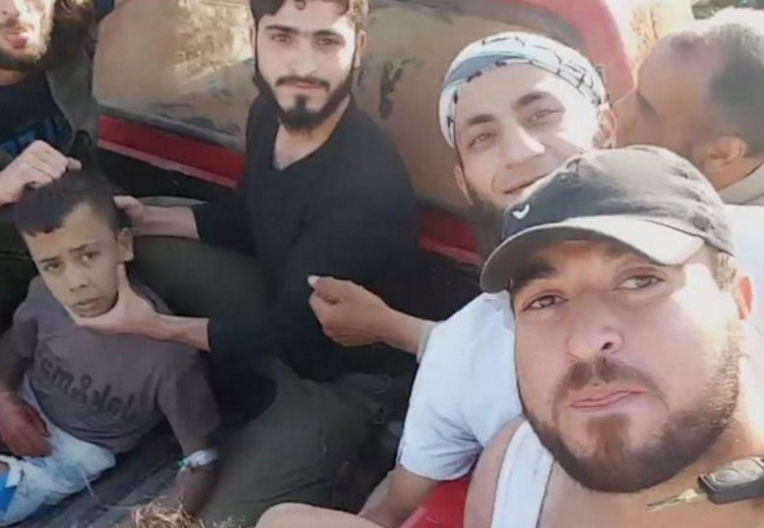 When the Red Crescent arrived at the bombing the “moderate rebels” turned them away. They did not allow ambulances and rescuers to take the remains and help the wounded victims until the White Helmets had taken their pictures and footage. Sources state that they were aware that the bombing would take place and were prepared to come in and shoot footage and act as if they were there to help the citizens. Additionally it seems now like the rebels took advantage of the chaos and abducted hundreds of the victims into rebel area. Up until September, Nour al-Din al-Zinki was a recipient of financial and arms support from the U.S. as part of a group of so-called moderate opposition factions working with a logistics hub partly run by the CIA. The group has also received support from Turkey, Qatar and Saudi Arabia. The government aligned forces have not committed any suicide attacks while al-Qaeda as well as Ahrar al Sham have committed hundreds. This was a “rebel” suicide attack, likely by al-Qaeda, against government aligned civilian refugees. The Syrian army has resumed the evacuation of residents from militant-besieged areas outside Aleppo after buses carrying them were hit by terrorists on Saturday, killing at least 126 people. The monitor group added that at least 68 children were among victims of the bomb attack. The death toll may rise further as “hundreds” more were injured in the blast, it added. Damascus decided that the deal and the evacuation should continue despite the massacre. The two towns in Idlib are too exposed and indefensible against a large scale attack. No bigger government operation towards Idlib could take place while they are held hostage. 55 buses from Zabadani and Madaya did reach Idlib city while 73 buses from Fuah and Kafraya reached Aleppo on Sunday evening as thousands of civilians exited enclaves to enter rebel and government heartland. To make matters even worse, Over 200 civilians from Foua and Kafraya have been kidnapped in the Rashideen area after they were supposed to enter government-held Aleppo on April 16th. The majority of those kidnapped are young girls. This video is dedicated to the souls of over 126 civilians from Kafraya and al-Fu’ah, who were massacred in cold blood by U.S. backed “moderate rebels”. At least 68 children were among the victims. 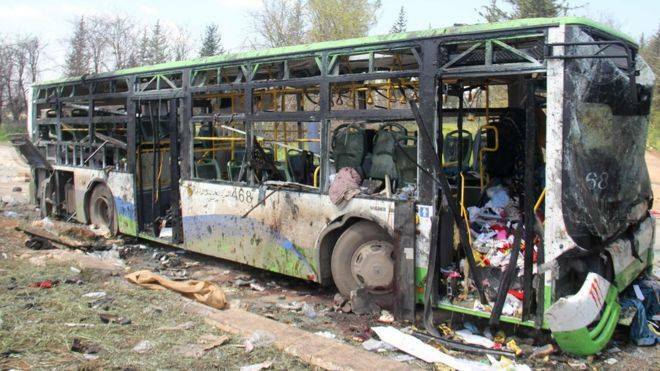 The bomber targeted buses full of evacuees from government-held towns as they waited in an Islamist-militants-held area on the outskirts of Aleppo. He drove his explosives up to their vehicles in a van meant to carry aid supplies. This article is exclusive to WeAreChange.org and was written by Sarah Abed (Facebook, Twitter).